Nina MacLaughlin spent her twenties working at a Boston newspaper, sitting behind a desk and staring at a screen. Yearning for more tangible work, she applied for a job she saw on Craigslist--Carpenter's Assistant: Women strongly encouraged to apply--despite being a Classics major who couldn't tell a Phillips from a flathead screwdriver. 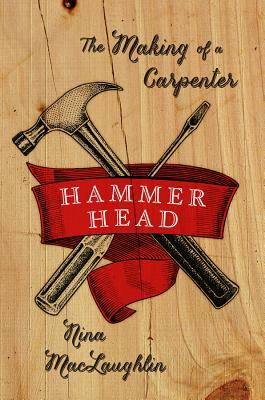 She got the job, and in Hammer Head she tells the rich and entertaining story of becoming a carpenter. Writing with infectious curiosity, MacLaughlin describes the joys and frustrations of making things by hand, reveals the challenges of working as a woman in an occupation that is 99 percent male, and explains how manual labor changed the way she sees the world. We meet her unflappable mentor, Mary, a petite but tough carpenter-sage ("Be smarter than the tools "), as well as wild demo dudes, foul-mouthed plumbers, grizzled hardware store clerks, and the colorful clients whose homes she and Mary work in. Whisking her readers from job to job--building a wall, remodeling a kitchen, gut-renovating a house--MacLaughlin examines the history of the tools she uses and the virtues and varieties of wood. Throughout, she draws on the wisdom of Ovid, Annie Dillard, Studs Terkel, and Mary Oliver to illuminate her experience of work. And, in a deeply moving climax, MacLaughlin strikes out on her own for the first time to build bookshelves for her own father. Hammer Head is a passionate book full of sweat, swearing, bashed thumbs, and a deep sense of finding real meaning in work and life.